Since our founding, we have expanded our product offerings with a broad range of power supplies, batteries and other electro-mechanical and electronic components. 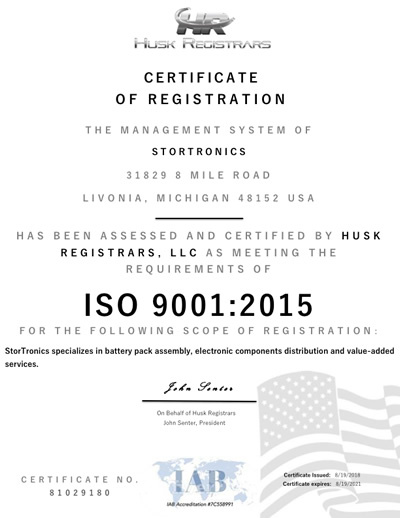 Consequently, StorTronics® is franchised by some of the world's leading manufacturers, most of which are ISO 9000 and 9001 certified. Our plans are to add quality product lines with a continued emphasis on components and value-added services in our area of expertise. In 1995, StorTronics® joined forces with the Rechargeable Battery Recycling Corporation, the nation's largest battery recycling program. As a participant in the RBRC, we have made a commitment to the responsible disposal of batteries and the promotion of such. Our Strength lies in the fact that we fulfill a need unmet by the national and large regional distributors - namely, superior technical support, locally stocked inventory, on-the-premises value-added assembly and service to all customers, not just the "major accounts." Our sales staff is trained to understand the technical aspects of the products and their applications and to work very closely with engineers as well as buyers. Our philosophy is to provide the best in services and products and to employ quality individuals to attain these goals. StorTronics will continue to be an evolving company always moving in the direction of excellence.